Next in the Best of Eleuthera series we take a look at Sunset Inn – right here in Governors Harbour. Situated just south of Governors Harbour right on Queens Highway it overlooks the Caribbean and is called Sunset Inn for a very good reason – viewing the sunsets from their deck is a wonderful experience…. 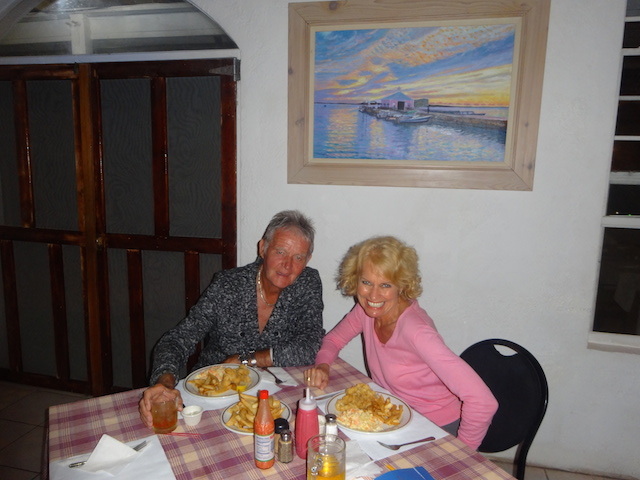 Sunset Inn is owned and operated by Lionel and Jaylia Fernander. Miss Jay – as she is known – does all the cooking – and it really is first class traditional Bahamian food. When you need a fix of fried food – which we all do sometimes – then this is the place to go. Grouper fingers and fries – best fries on the island I always say ! – or cracked conch and fries with coleslaw totally hit the spot . Grouper fingers and fries with coleslaw – plus an extra order of those fabulous fries !! If I am feeling virtuous then I have the poached grouper with a baked potato and salad – also delicious. Pausing – or posing ? – momentarily before digging in ! Sunset Inn opened on December 24th 1999 and has been going strong ever since. Open every day except Thursdays give them a try. Telephone number is 242 332 2487 – you can call for take-out orders as well…. 2 couples from Montana – above and below – enjoying food at Sunset for the first time. 2 couples from Montana enjoying food at Sunset for the first time. While you are waiting for your food – check out how many of the flags you can identify that are hung around the restaurant……..
How many from this picture do you know ? We loved our meals at Sunset Inn, went there twice.